First time out at this lake, just by the pendeltåg station at Haninge. Arrived around 10am and started float fishing worm, lots of small Perch, Roach and Rudd. Also fished ledgered worm and was setting up the livebait rod when i noticed the ledger tip bent over. Thought it was a Tench at first but was happily surprised to see a rainbow trout! My first ever. Weighed in at 0.92kg. Shortly after was bringing in a small float fished Rudd when a jack pike grabbed it from right in front of me. 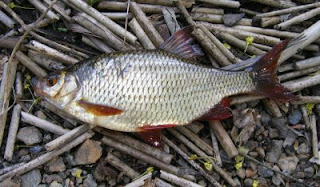 dropped off when I tried to pull it out and attacked the Rudd again the second I dropped it back in the water. I moved over the livebait rod and cought it after a few minutes, didn't bother weighing it as it was so small. A few more small fish and then it died down till around 3.30 when the float went under again. This time with prawn as bait. After a great fight I finally brought a beautiful 1.26kg Rainbow to the bank. I'll be heading back to this lake for sure, and soon. 5lb 3oz. 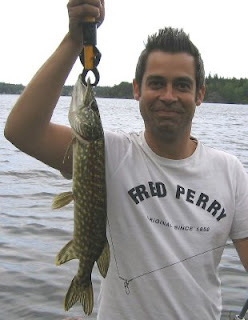 Pike for Ed..
1lb1oz. Rudd, my only fish of the day! Haircut badly needed! Drevviken today for Ed and I, arrived around noon. Ledgered worm was rather slow all day, though Ed had some Bream Roach and Rudd while I struggled to catch. At 2.40pm, right on the moon south trigger Ed had a run on his live bait which proved to be a fish I caught twice last year! 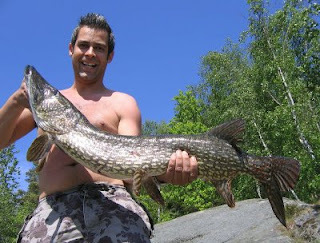 A cracking Pike of 13lb 2oz. on this occasion, this fish seems to be very territorial and remains in this swim throughout the warmer months of the year, perhaps even all year round. Got the photos quickly and the fish went back unharmed as they all should. A while later I banked a lovely Rudd of 1lb. 1oz, a pristine fish which proved to be my only catch of the day. Ed continued to thrash me with two further Pike, one of 5lb. 3oz. and another smaller fish we didn't bother to weigh. Packed up at around 5.30pm, a great day for Ed in the end, 9 points in total to him for the day and just 2 points for my lone Rudd. Out with Simon for a day at Tyresö Albysjön, a liitle dissapointing really, though there were signs of fish. 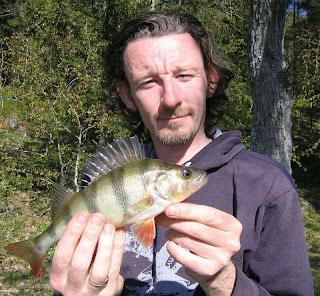 Two runs on the livebaits were dropped, Perch the culprit for one of them, dropping the bait when resistance was felt. Otherwise a few Bream, Roach and Perch were taken in the three swims we fished. This lake may be worth a night session or two this summer for Zander. Undoubtedly this lake may well hold some very big Perch too which are worthy of attention. 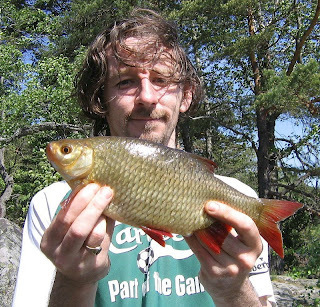 Spent the afternoon fishing Dammtorpsjön in Nacka out of curiousity. A very weedy lake makes fishing very difficult, the lake is also full of water lilies. Legered a worm on the quivertip rod, plenty of Rudd fell to the method, though nothing above 7oz, or so today. 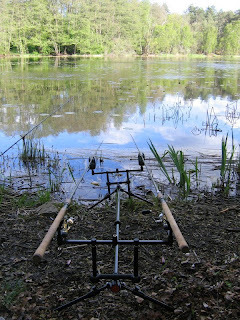 Of more interest was a screaming run on on of my ledgered boilie rods, the result was a powerful run which resulted in the fish running into a waterlily bed before the hookhold gave, to huge frustration on my part.